Below is an interview with Julie Faith Parker, Associate Professor of Biblical Studies. Her recent book, The T & T Clark Handbook to Children in the Bible and the Biblical World, co-edited with Sharon Betsworth, just came out in March. What need do you see “Children in the Bible and Biblical World” filling in religious scholarship? After presenting on the emerging academic field of children in the Bible and the biblical world, I am frequently asked, “Why weren’t scholars studying children sooner?” It’s a good question. Stories of children and youth are interwoven into the Old Testament, the New Testament, and the Apocrypha. Many famous biblical characters (Rebecca, Joseph, Moses, Miriam, Jesus—just to name a few) are first introduced to readers as children or youth. Issues that highlight children’s vulnerability (slavery, trafficking, use of child soldiers) are found in the Bible and call our attention to these pressing problems in the world around us. Stories about young people in the Bible can also be empowering to children and youth in our churches and communities today. How do you understand childist biblical interpretation as compared to a feminist approach? The term “childist” is still is new to a lot of people, but they can more easily understand what the word means when compared to feminist biblical scholarship. Like feminist interpretation, childist interpretation looks at specific types of characters in the text (women and children, respectively) with an eye to reassess their roles and importance. Recent developments in feminist scholarship also examine the construction of biblical characters; whose interests are being served in the portrayals put forth in the text? Childist interpretation asks the same questions about the Bible’s children. How might preachers incorporate insights focused on children into their sermons? What benefits might this approach afford to the preacher and their congregation? I am teaching a class this semester at General called “Moses, Miriam, and More: Children in the Bible.” The final section of the course is devoted to making our studies of children in the text come alive in the life of congregations. As I tell the students, one simple way to raise biblical children in the congregation’s awareness is to preach on stories of young people in the text. Most church-goers rarely hear sermons about children, so this topic captures the listeners’ attention. A childist sermon also sends an important message to all hearers (regardless of age): children and youth matter in the Bible and in the church. How might the intentional focus on children in scripture reignite one’s love of reading and appreciating the Bible? Learning about children in Scripture is exciting is because of all the fascinating, and often surprising, stories to explore. Many people familiar with the Bible do not realize that some ancient Israelites practiced child sacrifice, or that Jesus’ first words in the Gospels come from him as a child. Whether or not we have children in our lives, every adult was once a child and so has a personal way to connect with young biblical characters. Bible readers who focus their attention on the children will find themselves engaging this beloved, timeless text in fresh, challenging, and rewarding ways. What do you hope for the emerging field of childist biblical interpretation in the coming years? Many of my hopes are being realized now. When I began work on this topic during my doctoral studies (in the early 2000’s), there were very few published books that engaged the topic of children in the Bible. Slowly resources began to emerge, but over the past ten years publications have proliferated at an unprecedented rate. 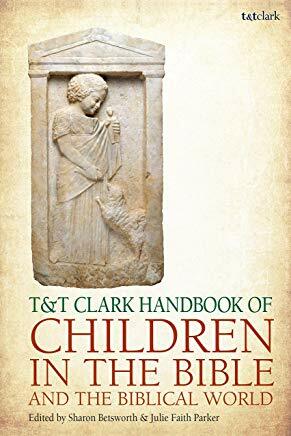 The T & T Clark Handbook of Children in the Bible and the Biblical World is the first of three collections of essays on children in the Bible coming out in 2019 (I have also contributed articles to the other two). Last year, I presented a paper at an international gathering of childist scholars invited to Berkeley, CA for a conference on shaping the field moving forward. This academic community is intentionally supportive of one another. I hear from increasing numbers of doctoral students around the country who are focusing their work on children in the Bible; this area of scholarship is well-positioned to keep growing. My hope is that the field of the children in the Bible, like a healthy child, will continue to thrive.